The F-5B is a direct descendant of the T-38 Talon. However,despite the visual similarity with the T-38, it is more like an F-5A in itsbasic structure. The F-5 series has a more powerful engine. It also has adifferent wing and engine intake. It also has a more robust landing gear thanthe trainer and is also wired for wing mounted ordnance that is not available inthe T-38. Like the F-5A, the F-5B also has the leading edge flaps not found onthe dedicated trainer. The F-5B was designed as a lead in trainer for those going on tothe F-5A or other high performance fighters. The major difference other than theextra seat is the lack of any gun armament. This was deemed unnecessary in alead in trainer. The aircraft quickly found buyers overseas, especially thosecountries who had already ordered or were building the F-5A. The F-5B also wasfound to be a very good aggressor aircraft and was still in service withcountries who had already retired the single seat F-5A. If you have read my reviewof the F-5A, you can basically take that to heart as much of this kit is thesame as that of the single seater. This kit has the same superb molding withengraved panel lines. The big difference is in the nose section of the kit. 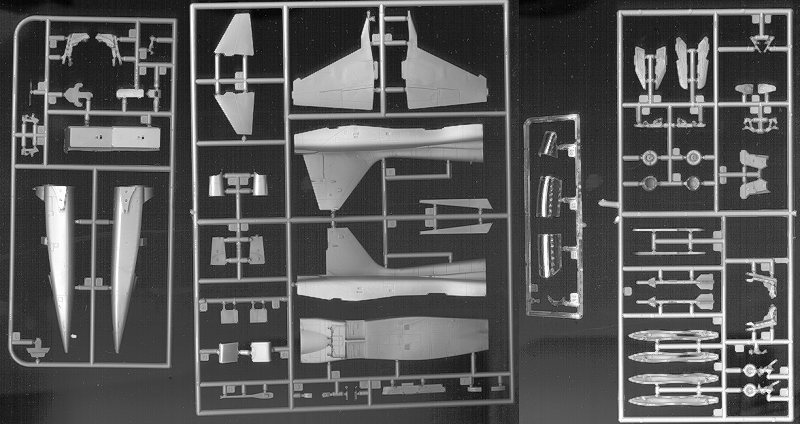 Theunderwing and centerline fuel tanks are not included in this kit, though thepylons for the wings are. You still get the option of wingtip fuel tanks orSidewinders. Like the previous kit, the canopies can be positioned open shouldyou desire There are also additional aft fuselage scoops for the NF-5B. Frankly,you should fill in the slots under the wing for the weapons pylons as the F-5Blooks much better without them! 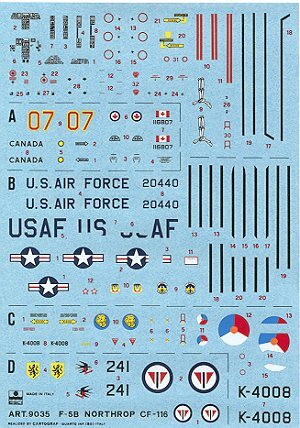 This kit also has 13 constructionsteps and the same excellent color chart. Like the previous kit, there aremultiple markings options, in this case also four. Decals in some way mirrorthose of the single seat aircraft as there is a NATO camouflaged Dutch NF-5B anda Norwegian F-5B in overall silver. However, there are two different schemes,including a USAF F-5B from the 425th TFTS at Luke AFB with broad yellow bandsover the silver paint scheme. 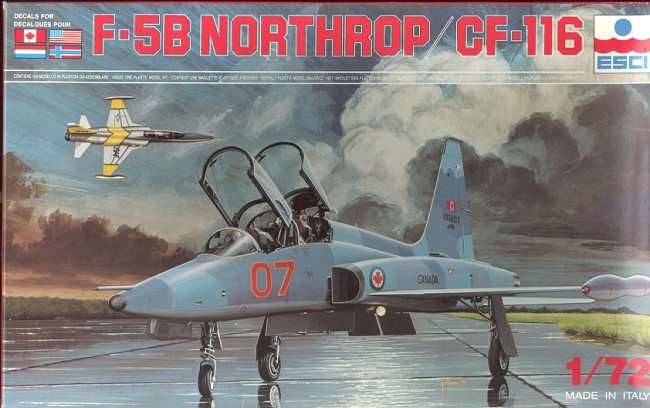 The other addition is a Canadair CF-116B from ColdLake in a nice multi-hued aggressor scheme. Like the other kit,this one may be difficult to find. AMT/ERTL bought all the ESCI molds many yearsago. It, in turn, was purchased by Racing Champions who have no real interest inthe plastics division and are undergoing a financial crisis at the moment. It isunlikely that this or any other of the fine ESCI aircraft kits will be reissuedin the near future so if you see this kit at a swap meet or shop, buy it. You'llbe glad you did. The F-5B can also be found in AMT boxings and isexactly the same kit as this. If you would like your product reviewed fairly and fairly quickly by asite that has over 1,000 visits a day, please contactme or see other details in the Note toContributors.